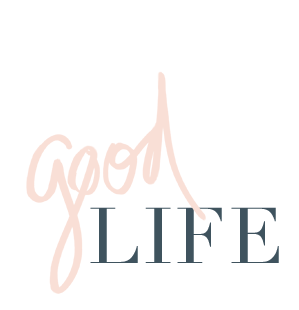 jillgg's good life (for less) | a west michigan style blog: healthy living: 4 easy low carb meals! healthy living: 4 easy low carb meals! Many of us set goals in the New Year and often times they involve eating better, but how are you doing now that January has already passed us by? Being realistic and flexible with your nutrition plan as well as finding quick, easy, and healthy recipes to add to your family's meal rotation is one way to make sure you stay on track with a healthy lifestyle. 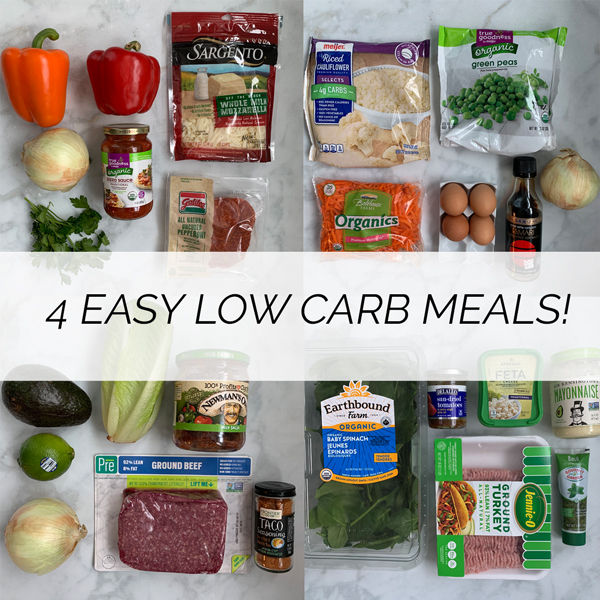 Check out these easy lower-carb but delicious meals below if you are looking for some new food inspiration! I was brainstorming ways to make a healthier version of one of my favorite foods (pizza) and almost used portabella mushrooms but decided to go with bell peppers instead as the "crust". I made these for the first time recently and can already say with certainty that they will be at least in my monthly meal planning rotation. Did you know that bell peppers actually have more vitamin C than oranges? With this recipe, you will literally eat an entire bell pepper in one sitting. Add on a side salad to up the nutrient density and satiety factor of the meal even more. The whole family will like this recipe and you could always use English Muffins for some of them instead of the bell peppers for the kids. To Make: Cut the top off of the bell peppers and cut them in half. Remove the seeds and veins. You may need to trim some extra off of the side of the pepper to make them flat and easier to top. Top the pepper halves with pizza sauce, cheese (full-fat melts the best), and toppings of your choice (I used onion and nitrate free Pepperoni). Bake on 375 degrees for 10-15 minutes or until cheese starts to brown a bit with an option to broil for a couple minutes at the end to crisp them up. 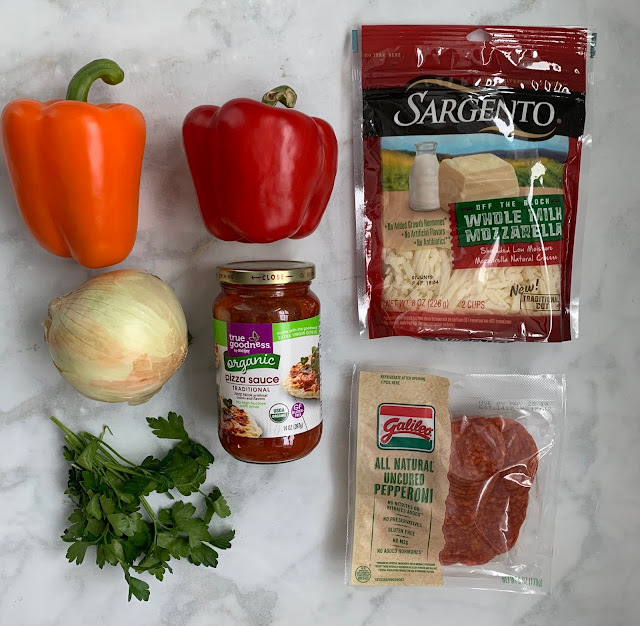 This is another recipe that the whole family will enjoy and you can always have some taco shells or chips available to make "real" tacos for family members who aren't looking for a lower carb meal. When buying ground beef, I always suggest buying grass-fed beef as it is more nutrient dense than conventional beef. To make: Cook ground beef (add in some onions and peppers for more nutrition if desired) and sprinkle in taco seasoning. Mash up an avocado with lime and salt for a quick guacamole. Wash the romaine leaves and use them as taco shells. 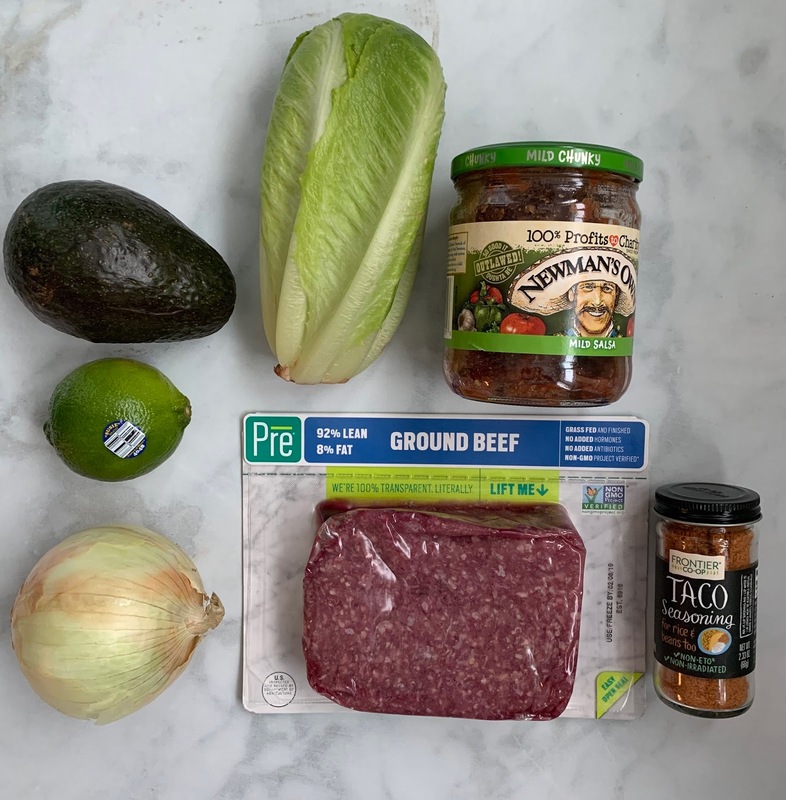 Top the romaine with the seasoned ground beef, guacamole, salsa, and whatever other toppings you want! Sometimes I will crumble just 1-2 tortilla chips onto the lettuce wrap for a little crunch. 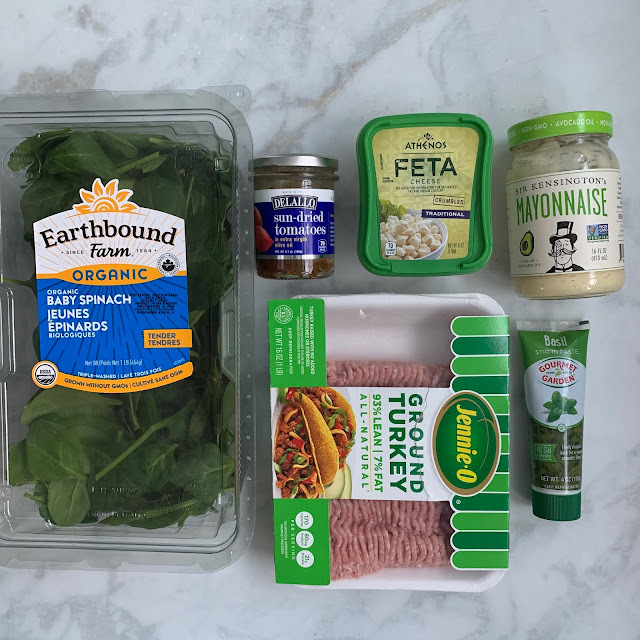 Let's be honest, regular turkey burgers can be a little boring and bland, but these turkey burgers with sundried tomato and feta added in are super flavorful and delicious. I would suggest getting the sundried tomatoes that are packed in olive oil because this helps keep them from drying out. You can usually find these in the tomato sauce aisle. You can serve the burgers on a bed of spinach or mixed greens and top with a basil aioli (basil mixed with mayonnaise). I used the tube of basil that you can find in the produce department since it's not basil season. For a higher carb option serve with sweet potato fries (homemade or frozen). To Make: Combine 1 pound of ground turkey in a bowl with about 1/4 cup of feta cheese and 1/4 cup of chopped sundried tomatoes. Sprinkle in other seasonings as desired (like salt, pepper, and garlic powder). Make the mixture into 4-6 patties and grill on both sides until they reach an internal temperature of 165 degrees F.
I'm all about frozen cauliflower rice because ricing your own cauliflower makes such a mess in the kitchen. 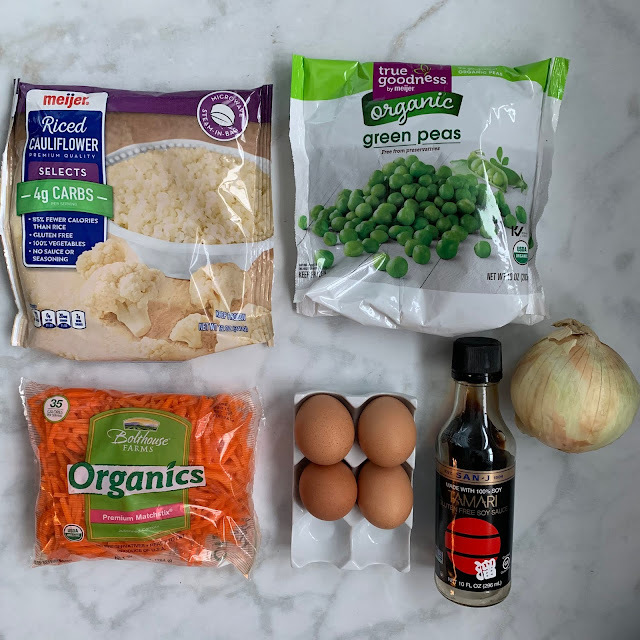 This cauliflower "fried" rice couldn't be easier and you can season it however you want. You can leave the peas out and replace with broccoli or bell peppers if you are looking to keep the carbs super low. To Make: Sauté the onion and carrots in oil of choice (I suggest olive or avocado oil + a little sesame oil). Mix in the frozen cauliflower and peas and cook down until they are warm. Add in some tamari or soy sauce and garlic powder for flavor. For the eggs, crack them into a bowl and whisk them up with a small amount of water. Move the cauliflower mix to the side of the pan to leave an open space for the eggs. Scramble the eggs up and mix into the cauliflower mix. Enjoy! Kelsey Stricklen, MS RD CLT is a Registered Dietitian who specializes in women's health and food sensitivities. She runs a virtual private nutrition practice out of Grand Rapids, Michigan. You can find here at Root Functional Medicine online or on Facebook.